In February 1982, Scott Schwebel and I, who had been close friends since fourth grade, went out in search of an album. We drove to each of Bakersfield’s five record stores. None of them had the album. And worse, none of them cared. Not cool.By the time we got back to his house, Scott said we had to open our own store. I said, “No…OK.” After four months of construction, with immense help from family and friends, World Records opened on June 12, 1982 at Oswell and Columbus. Scott and I were 22 and 23 years old and had a record store. We thought that was pretty cool. We kept our ‘real’ jobs, thinking the store would be profitable on its own. Not quite. That September, Scott went out to dinner with his fiancée Linda, said good night, and died in a wreck on the way home. I spent four months trying to figure out which way was up. The store was adrift and the staff ready to move on. I coped by quitting my financial analyst job to focus on making Scott’s idea succeed. To Scott and me, a cool record store would be well-stocked, well-organized, have good prices and a staff who cared more about the customer’s music than they did their own. So this was the model I pursued. Lots of folks responded to the effort. We gathered customers. Many became friends on a first-name basis. CDs began showing up in the mid-eighties. By the end of the decade they were beginning to squeeze out LPs and cassettes. Because CDs were more expensive, customers wanted a way to make sure they were buying something they would like. 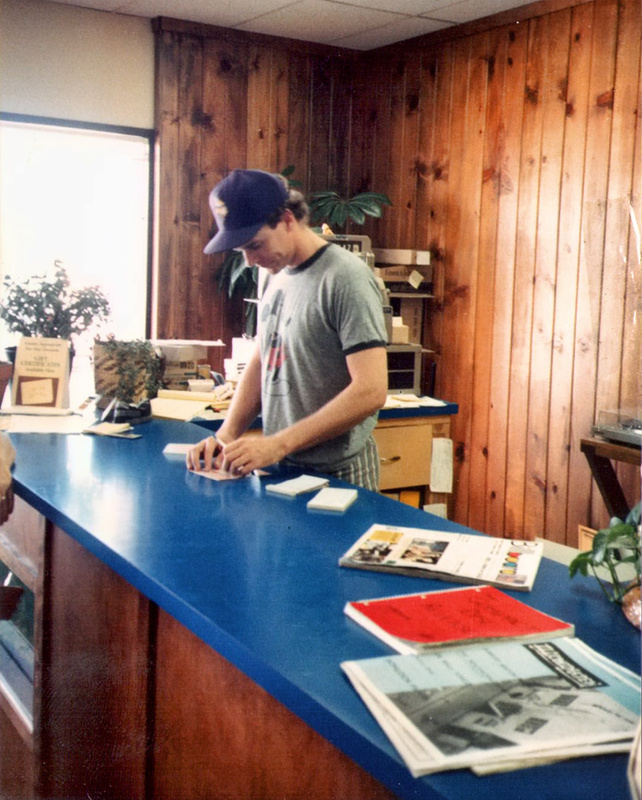 In 1992 we moved to Stockdale and Coffee in order to showcase an addition to our business model three years before it started showing up at other stores – headphone stations so customers could listen to anything we stocked. More customers. More friends. By the mid-nineties several factors led us to make another addition to our model – put on concerts, especially for artists that are highly respected, but not well-known in Bakersfield. Put on shows as music fans on behalf of music fans. Showcase people, not products. Therefore never resort to ticketing service charges or commercial sponsors. Regularly partner with local causes. More customers. More friends. World Records hummed along well into 2003 selling CDs and staging shows. Then the ground began to shift. Recorded music was now digital and easy to pirate. Baby boomers already owned most of the music they wanted. And the general economy was heading into the tank. CD sales plummeted. Record labels, desperate to move inventory, cut deals with Target, etc., so that CDs were selling up the street at far below our cost. By 2007 most record stores in America had closed. If we were just a business we also would have. But we weren’t. So we didn’t. In 2008 we decided to move downtown to cut rent expense and get further away from the Rosedale strip. Word of our ‘closing’ travelled fast and wide. By phone and by foot we were inundated with people telling us how much the store means to them. Most prefaced their remarks with apologies for not shopping at World Records like they used to. Our ‘closet’ of a store on G Street gave us a chance to assess our position. Let’s see, we’ve made tons of friends over the years. They think our store is very cool. They respect what we stand for. They tell us we make this community a better place to live. They hope we’re doing really well and don’t want us to close. But they need a new reason to visit. A good record store is a cool, disarming place to be. It houses the collective spirit of artists that created masterpieces as well as artists that flashed for only a moment. We’ve spent years watching people come to our store to take a break and relax in the company of music and people who believe music matters. They come to World Records to talk music and connect with their passion. So after lots of thought… We had an idea – Find the right building, in the right spot, with plenty of parking, put in our record store and a sweet-sounding theater for our concerts. We bought 2815 F Street. After 5 years coming up with a design, and two years of construction, we moved into our beautiful new record store and are welcoming great national artists to our stage. On behalf of our customers who make our local store and our commercial-free shows possible, and all the friends who have given their help when we really needed it, World Records looks forward to a bright future in our community. 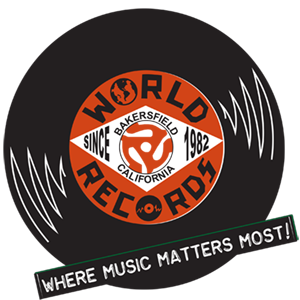 World Records has a great selection of CDs, LPs, DVDs. We get most special orders overnight. We Buy & Sell Used Vinyl. We also sell record players, t-shirts, and more. Let our 35 plus years of experience work for you. have been meaning to add to your collection? Call us today: 661-325-1982 We can help! or contact our store during business hours. We send out a weekly email with information about our store, its upcoming shows, and a list of the week’s new releases. Music is for ALL ages. ‘No Stinkin’ Service Charge’ concerts healthy and happening!